It's hard to believe that it's been 50 years since Humans first traveled to the Moon. No, I don't mean Neil Armstrong and Apollo 11, when humans first walked on the Moon (I'm sure you'll hear much more about this next year). I mean Apollo 8, when Mission Commander Frank Borman, Command Module Pilot James A. Lovell Jr. and Lunar Module Pilot William A. Anders were the first humans to actually go to and orbit around the Moon (ten times). This was when humanity finally became true space travellers. The spirit of this historic journey was beautifully conveyed in a live TV broadcast from lunar orbit on Christmas Eve 1968, with the crew reciting from the Book of Genisis: "In the beginning God created the heavens and the earth...". And a few days later, the crew returned to Earth and the world got to see their stunningly beautiful image of a small, fragile Earth in the blackness of space, hanging above a barren lunar landscape. "Earthrise" made the cover of many news magazines and became the symbol for the growing global environmental movements. The Geminids is arguably the best meteor shower of the year, though it happens at admittedly a less comfortable time in terms of temperature. Any time after it gets dark on the evening of Thursday December 13th would be a good time to start looking, with the number of meteors visible expected to increase through the night, producing as many as 2 meteors per minute if viewing from a dark location. Friday evening should still be good for viewing, though the number of meteors will be considerably less. You don't need any special equipment to view the meteors, but I strongly recommend using a full body-length reclining chair so you can comfortably be looking almost straight up at the sky for long periods of time. The meteors can and will appear everywhere in the sky, though they will seem to be coming from the direction of the constellation Gemini (hence, their name). 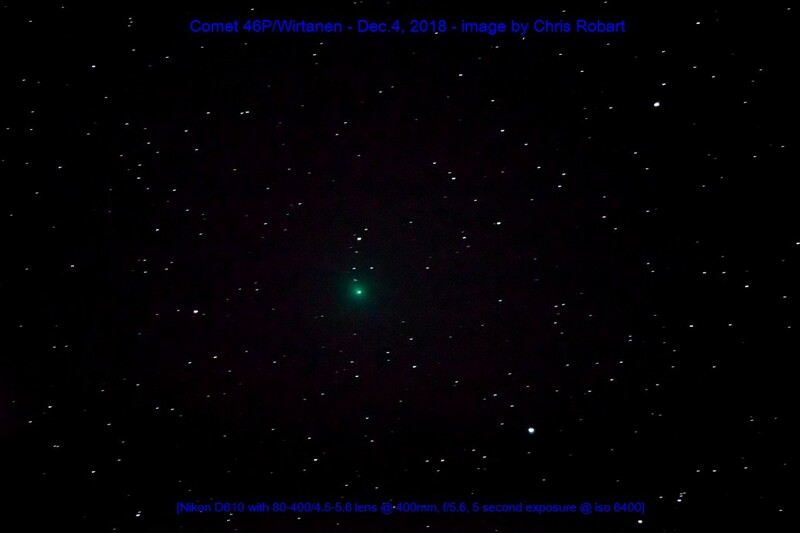 There is a chance that periodic comet Wirtanen will become bright enough to see with the unaided eye this December. It swings closest to the Sun just a few days before it swings near the Earth on December 16th. It is already bright enough to capture in just a few seconds using a tripod-mounted camera and telephoto lens, as shown here in this picture taken by DDOD contributor Chris Robart on Dec.4th (a 5 sec exposure at f/5.6 with 400mm lens showing 4x6 degrees of the sky). The David Dunlap Observatory lies nestled in the heart of Richmond Hill, Ontario, a city of 200,000 just north of Canada's largest city, Toronto. In 2007, the 190-acre oasis of mature forests, pastures and springs was home to two distinct deer herds and an abundance of other wildlife, including a coyote pack, foxes, voles, rabbits, honey bees, many species of butterflies, and birds including hawks, owls, doves, crows and songbirds. The property represented the last and largest urban open green space in southern Richmond Hill. Originally deeded to the University of Toronto by the philanthropist Jessie Donalda Dunlap in memory of her husband David, the Dunlap Observatory opened on May 31st, 1935. Its magnificent 74-inch telescope was the second largest in the world at that time and has been used through seven decades to conduct much groundbreaking research, including proving the existence of the first known black hole, Cygnus X-1. In 2007, the University of Toronto wrested control of the land from Jessie Dunlap's heirs through a protracted legal case spanning 4 years. They then broke the public covenant that the land would remain a park and a research and outreach centre in perpetuity by selling the property to a developer intent on replacing most of the greenspace with many hundreds of houses. The DDO Defenders have been working hard since 2007 to represent the public and inform all levels of government about what would and now has been lost as the developer is allowed to proceed. 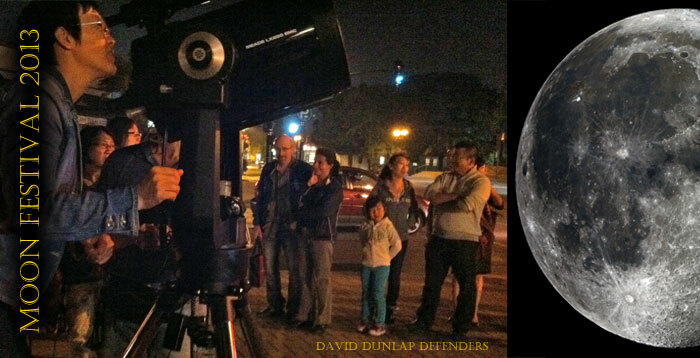 On April 12th, 2012, after six long and anxiety-ridden months of Ontario Municipal Board (OMB) mandated mediation following a four year hard-fought and very public battle, an agreement was reached between the mediation parties to the David Dunlap Observatory Lands OMB case. Ian Shelton - Chair, DDO Defenders Inc. The Minutes of Settlement is posted at the Town of Richmond Hill - DDO webpage. The DDO Defenders are deeply committed to preserving the David Dunlap Observatory, surrounding Lands and the Dunlap Legacy. Our mandate is to ensure that the campus continues to operate as a world-class astronomical and astrophysical research facility and a centre of excellence in public Outreach, Education and Experiential Learning regarding all aspects of Science and the Natural World. © 2018 David Dunlap Observatory Defenders. All rights reserved.